Don’t get excited. No, the most prolific and greatest songwriter of the century, Willie Nelson, celebrated his 78th birthday just a day after Dearly Demented Mom’s, so I expect he’ll be around quite a while. 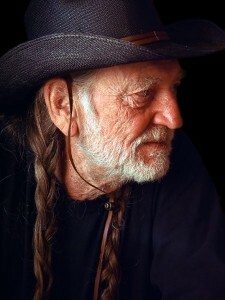 Willie’s just fine, but his music is not. And neither am I. Working out of the house has its pluses and minuses. Sure, I might writing this column in my pj’s and unquestionably with no make up on, but I have little interaction with the outside world. Dearly Demented Mom and I never have discussions around the water cooler. So, I must find something on cable to connect to the real world and drown out Walker, Texas Ranger reruns coming from the other room. The news is extra depressing to a humorist, so I choose music as my companion while I ramp up as a Media Mogul. Unfortunately, it’s impossible to get a clear radio signal in the hills. Being a former disc jockey and music director, I’m fairly picky about my music. Since I’ve “Gone Country” I prefer some good C & W over opera. Of course I never really did like opera anyway. My favorite station, Willie’s Place, comes to me through my cable provider. It’s Texas Country which is much different than Nashville Country. Today’s Nashville music is so over-produced that it sounds like Octomom looks. On the other hand, Texas Country is as rowdy as the Teenage Eating Machine with a full tank of gas and $20 in his pocket on a Saturday night. It keeps me happy and tappin’ my bare feet under my desk. Willie’s Place sounds just like a good Texas honky-tonk jukebox. That was until last Wednesday when some extremely uniformed NYC executive types combined Willie’s Place with another one of their stations, Roadhouse, into Willie’s Roadhouse. Just imagine your favorite honky-tonk turning into a Seniors Center and you’ll get the idea. Suddenly my ears have been subjected to the screeches of Lynn Anderson singing, “How Can I Unlove You?” Easy, Lynn, charge up his credit cards and leave the jerk. I called Very Best Friend wailing. I gave Willie’s Roadhouse a try for about 6 hours. After the fourth Statler Brothers song, I ran screaming to The Funny Farm with a splitting headache. I felt like planting some cotton just to get back to my roots. Since then, I’ve tried all the other country stations to no avail. Then I got creative and started pushing “page up and page down” on my remote. To date, I’ve been through Tropical Breezes, Little Italy, Moodscapes, Soul Town, Underground Garage, and 24 hours straight of nothing but Elvis. Now I know why he died. And I simply refuse to turn into a Jimmy Buffet Parrothead. Willie, please do something about this. Save my world. If nothing else, bring the Honeysuckle Rose to the Dancing Dog Ranch and we’ll do a free concert for all those poor souls, like me, who miss our Willie. It’ll be music to our ears.